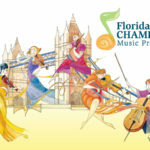 The Florida Chamber Music Project (FCMP) kicked off season three with a preview concert and exhibition of original art at the Ponte Vedra Inn & Club on September 24. Dozens of paintings and the artist Dr. Susanne Schuenke illuminated the evening event. Schuenke also unveiled an illustration featuring the musical ensemble which is reproduced on posters promoting the FCMP Season. FCMP performed the music of Handel/Halvorsen, Dvorak and Mozart before joining the audience for a dessert and coffee finale.